We have pictures of two creatures that you might not think are fierce predators of fishes. Take a look at these two hunters and let us know if they are a surprise to you! 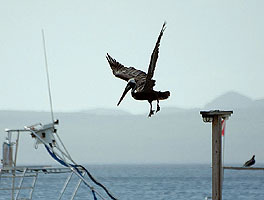 A fierce predator of fishes in shallow water, Pelicans dive into the ocean to catch fish in their big beak pouches. Click here to see this bird splashing into the drink near Bonaire! 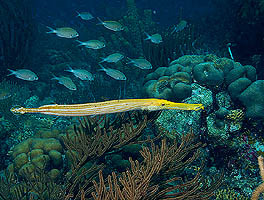 We've seen Trumpetfish before, but finding them in this terrific gold color is unusual. Click here to learn how this slender fish stalks its prey.